An aggravation or vitiation in the fire or pitta dosha along with sun rays causes this disease. Redness, swelling formation on the part of the body exposed to rays of the sun or excessive heat. According to Ayurveda health of a healthy person is affected by two causes according to the source of diseases. Sunburn is known as Daah or Daagdh rog in Ayurveda, it is caused by external factor SUN RAYS that’s why its belong to the Agantuj rog. The sign and symptoms of sunburn may vary from person to person. You may not notice redness of the skin for several hours after the burn has begun. 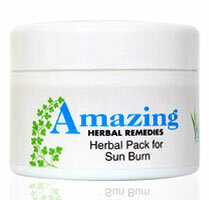 Ayurvedic Experts formulated and tested to treat mild redness to a blistering burn with swelling. 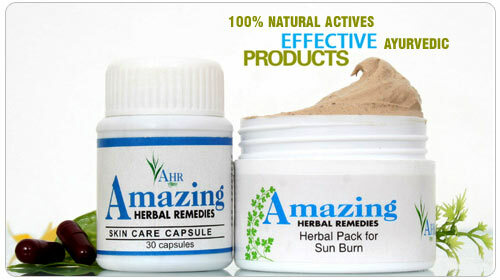 *100% natural active ingredients, safe with NO-SIDE EFFECTS. Provides instant relief for exposure to sun, relieves discomfort, cools and soothes, non-irritating. Effective for sunburn on different parts of body. Treatment time: differ depending on how serious the sunburn is. The herbal pack provides hydration therapy to the damaged skin to enable it to restore its lost shine & glow. The observed content of the pack also acts on the superficial skin that Sooth, cool & heal sunburned skin. 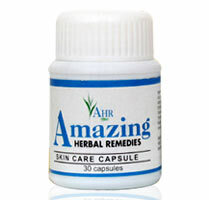 Fast relief from the discomfort, start the skin cells to healing themselves right away and you’ll see instant results. This not only reducing the pain, swelling, redness and itchiness of sunburn, but also helping resolve the dangerous DNA damage that can be the start of skin cancer. Also good for minor cuts, scrapes and insect bites. Herbal Skin Supplement & its natural herbs helps to balance all three body humor or doshas (vatta, pitta, kapha) in skin & body. Internal Skin Supplement targets those areas inside your body where imbalance begins. Herbs in it work to naturally cleanse, purify and detoxify the body and help heal from within. Contains specific nutrients that are not easily obtained from dietary sources alone that influence on healthy skin by controlling melanin. In the skin it help to absorb the light, act as antioxidants and have an anti – Inflammatory response to sunburn. It act by increasing the circulation of the blood to the skin and thus its nutrition. The better skin nutrition the less its scariness and roughness, and more improved its thickness and hydration. Sunburn results from too much sun or sun-equivalent exposure. Almost everyone has been sunburned or will become sunburned at some time. Anyone who visits a beach, goes fishing, works in the yard, or simply is out in the sun can get sunburn. By following few simple tips you can minimize the ill effects of Sun Burn, and also you can get the best results from the sunburn treatment. Yoga and exercises is very good for health. One should go for morning and evening walk, do different breathing exercises and yoga asanas. There are not particular yoga posture which help directly in reducing scar marks but some posture according to yoga which help in toning skin and help in radiant look skin by balancing dosha’s status in body. Balance Diet for Scars: useful diet in sun burn. Eat fruits which are high in water content like watermelon, oranges, sweet lime. High content of vitamin C, vitamin E, vitamin D, which are essential for your skin and the healthy tone of your skin, and also to prevent decreasing your risk of getting cancer. Small red tomatoes nestling among green peppers, sliced carrots and spring onions not only brighten up a salad but also give some protection against a wide variety of cancers. People may be less likely to suffer sunburn and prematurely aged skin if they eat tomatoes, rich in lycopene, and other fruits and vegetables rich in carotenoids. The carotenoids in tomatoes, peppers and pomegranates once eaten are later widely distributed in the epidermal and dermal layers of the skin. Avoid greasy after-sun creams as these tend to trap the heat. Avoid direct sunlight, cover exposed skin. Cool (not ice cold) baths may help. Avoid bath salts, oils and perfumes because these may produce sensitivity reactions. Avoid scrubbing the skin or shaving the skin. Use soft towels to gently dry yourself. Don’t rub. Apply sandal wood paste over the affected areas. Onion juice is also helpful in local application. Apply curd on the affected area and let it dry, then wash and apply again. Rose syrup, lime juice can be taken 2-3 times a for the internal cooling. Steep 5 tea bags in 2 cups of boiling water for 20 to 30 minutes. Pour tea into a bathtub filled with cool water. Soaking in chamomile tea helps soothe inflamed skin. Black and green teas contain tannins, which help take the sting out of sunburn. Mash ripe strawberries and apply directly to sunburned skin. Place peeled, thinly sliced cucumbers directly on sunburn. Remove when cucumbers are warm. Cucumber slices are especially good for delicate skin, for example the face and neck. The best prevention is to avoid the sun. This is often not practical or desired many times. Other, more practical strategies include wearing wide-brimmed hats, long-sleeved shirts, sunglasses and long pants. People seldom apply enough sunscreen or rarely reapply it. Sunscreen should be applied in generous amounts in layers and reapplied after being exposed. Activities such as sweating and swimming degrade its effectiveness & Sunscreens are not waterproof, though few claims. Mind-altering drugs (including alcohol) can diminish your awareness of getting sunburned and should be avoided. Avoid tanning beds entirely. Most tanning parlors make safety claims that are false. Plan outdoor activities early or late in the day to avoid peak sunlight hours between 10 AM – 5 PM. This entry was posted in Clinic Remedies and tagged Ayurveda, Blisters, Blood Pressure, Herbal Products, Herbal Remedies, Home Remedies, Redness, Sun, Sun exposure, Sun Rays.